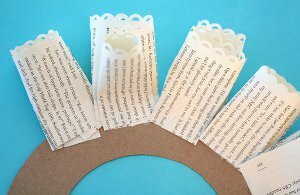 This beautiful Book Wreath is a great way to decorate your reading nook or library. 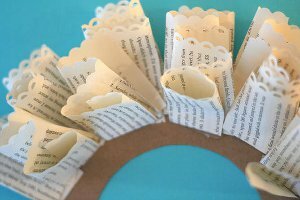 Made with a cardboard frame and pages from a book, this DIY wreath is so simple to make, yet gives any room in your home a stunning accent piece that everyone will love. 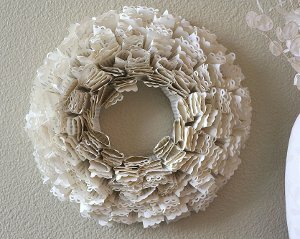 You could also use this technique to create a wreath using magazine pages, comic book pages, or even tissue paper or construction paper. Let your creativity run wild with this easy and fun paper wreath. Tear out pages from a book (mine is from the dollar store) and run a border punch along the straight edge of each page. This went much quicker than I anticipated as I was able to run three pages through at a time. So pretty! The scalloped edges add such a lovely old-fashioned touch. Rolling the pages on a diagonal could add even more flair to the wreath. 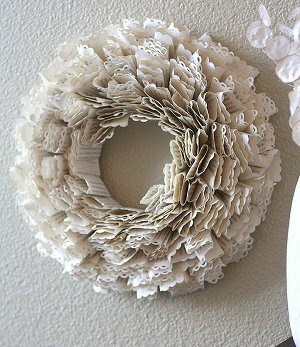 I've made book wreaths before with a diagonal roll (pictured below), but I never thought to add the scallops. I love it so easy and beautiful. I love this idea. I have a lot of old nooks that have yellowed and also I know how to use tea to stain the other ones. It will look very nice on the wall of my den. It's very classy looking. Thank you for sharing this very easy and pretty project. I can totally see myself making this wreath. It's so beautiful. I have a couple of old books from my mom's attic that are super yellow and a few bleached white ones that will contrast perfectly. I don't have that edge punch detail on the paper. I have a ton of recycled magazines that this would lend itself to. I also could see this being something rather therapeutic to do when troubled or home sick, that would be calming, and also good exercise for arthritic hands! Easy, fun, green and therapeutic! Great project! This is such a great idea for all of my damaged-beyond-recognition books. Neat. This is a great way to recycle damaged books, rather than throwing them away! I can't wait to give this a try. I think it is a super looking wreath. I wonder what it would look like with the edges of the pages torn or tattered? I kinda like the idea of passing old books on to others who might like to read them. I often pass on old books. However, some books are too damaged to be readable. I use those for crafts. o, I dunno. I don't like the idea of destroying books, old or otherwise. Some of the best reads can be dusty old books from previous centuries. There must be SOME other text you can make wreaths with. - Maybe Gossip Magazines - ? Certainly more colorful. - Old newspapers? - They turn a nice sepia color after a while. So, you would pass a book on to someone who wanted to read it, knowing that some pages were missing or so damaged that one could not decently read the book and expect to get the entire story? I made a cone book wreath several years ago and love it. Still use it at Christmas. It's amazing what you can do with old books. As much as I love books and love to read, I did not feel guilty about taking a book apart for that use. What a great idea! I have so many books to clear out, this is a better alternative and more fun too. I am liking the natural page coloured look but I think I will experiment with some inks lightly sprayed to brighten up a little. I don't have the apron lace border punch so I will just use one of the other types I have should work out just as well. I think it looks lovely, I would like to print out my own pages of script and make one for Christmas. Thank you for such a lovely idea. I suppose you'd keep using pages until you have the size or thickness you want, maybe from 2-3 sources. I don't have any fancy tools to use on border except maybe my SS cutting scissors with different designs. Using white pages one could gently spray paint the tips a bit - like hold the wreath far enough away that it wouldn't be "painted", just "tinted", for whatever event you needed it for. Cute idea. I've seen similar wreaths on Etsy and am happy to have some instructions now for a jumping-off point to make my own. As for "destroying a book to create this," I'm a decent and intelligent book SELLER and am here to tell you that just because it's a book doesn't make it valuable or worth keeping AS a book. 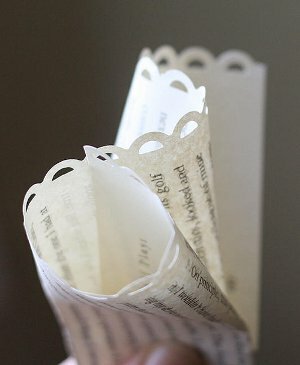 I rescue tattered books all the time and sell them on Etsy for crafters to play with without feeling guilty about it. Check out thrift shops and garage sales for books with interesting typefaces, beautiful illustrations (even if it's just for the colors used in them), or with the patina of age (that lovely tan color so many old books get...even foxing (brown spots)) which can all look attractive in a wreath. BTW, those pop-up ads in each picture are REALLY annoying! I live in a Nursing Home here there an always old magazines papers & books. This would be a great craft for those of us that are always looking for something fun & interesting to do. How many pgs. are needed and how many papers are needed to fill each wreath etc.? With all the junk snail mail that arrives daily, why would a person who was decent and intelligent want to consider destroying a book to create this? If text is a design objective, discarded computer printouts sould work. What if the book has missing pages? IMO, missing content makes a book not worth salvaging.